The Funky Felter: Upcoming Valentine's Day Arts and Crafts Show at the Westport Flea Market in Kansas City Missouri Features Handmade Creations for your Sweetheart! 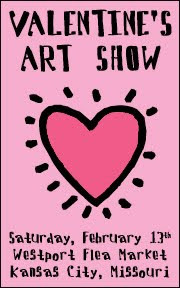 Upcoming Valentine's Day Arts and Crafts Show at the Westport Flea Market in Kansas City Missouri Features Handmade Creations for your Sweetheart! I will be a vendor at this local upcoming event. Join myself and several other handmade artisans at the Westport Flea Market on Saturday, February 13th, from 10 A.M. to 5 P.M. It is the ideal place to buy something for those that you love or just a little something special for yourself! I will be selling my handmade needle felted heart jewelry there as well as my needle felting kits and new line of note cards and tags. There will also be some of my nuno felted scarves and other fashion accessories available. Click here for driving directions, a list of vendors, and complete event details. I hope to see you there!